“We’ll put this out and the kids won’t like it,” is a refrain Jason Morse heard much too often from cafeteria staff in his years as executive chef for Douglas County School District in Colorado. His reply: “Don’t be afraid.” To get kids on board with a new ingredient or menu item, operators have to market like they’re a restaurant and engage students, parents and staff, says Morse, now a K-12 foodservice consultant. 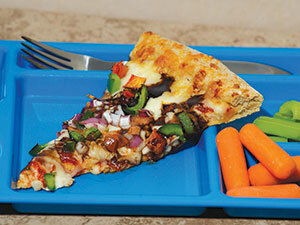 Before he introduced a roasted-veggie balsamic pizza and sweet-chili chicken to the menu, Morse sampled the items with cafeteria staff. “The people cooking the food have to love it, then the students will love it,” says Morse. But it’s key that a new item doesn’t add significant labor. This pizza, for example, starts with a frozen proof-and-bake cheese pie and gets drizzled with a prepared balsamic glaze; the kitchen cuts and roasts the veggies. In Freeport School District 145 in rural Freeport, Ill., Foodservice Director Amanda Williams found parents to be “the most surprising challenge” when she came on board in May 2015. “My goal was to offer more food made from scratch. We had the equipment and staff who wanted to cook, but I really needed to educate the community,” she says, which was used to a menu of pre-packaged foods. Williams wrote a newspaper article explaining the changes she wanted to make and her reasoning, and positive feedback gradually started coming her way. For breakfast, she introduced a parfait made with vanilla yogurt, seasonal fruit and a crumbled, whole-grain cookie baked in-house. “The kids are scraping the cups clean,” Williams says. A breakfast skillet with black beans, hash browns, cheddar and eggs also went over big. Lunches include a butternut-squash lasagna, chicken soup with kale and chicken-curry casserole. Williams, who trained and worked as a restaurant chef in Chicago, now eats lunch every day in one of her cafeterias so she can interact with and educate the 4,100 students in her district, “many of whom had never seen a fresh pear or squash before,” she says. Although the homemade meals are more labor intensive, “when you train and engage staff, you get money back in unusual ways,” says Williams. “Many of the kids who never ate the food now have a declining balance [on their meal cards].” She also is collaborating with the curriculum coordinator to incorporate more classroom nutrition education into the district’s 10 schools. To get staff, kids and parents engaged in healthy eating, 75 schools in New York City partnered with WITS—Wellness in the Schools—a nonprofit that works directly with food managers in the cafeteria. Culinary school grads train and support staff, and WITS employees and volunteers teach cooking and nutrition to about 35,000 students. “The kids go to WITS lab for a class period,” WITS Program Director Marjorie Wolfson says. The items they prepare—such as veggie chili, hummus and greens with dips—all are served in the cafeteria, “so there’s a connection between what they learn and what they eat,” she says.